In the center is the clock tower, erected in 1893, in a yellowish brick. 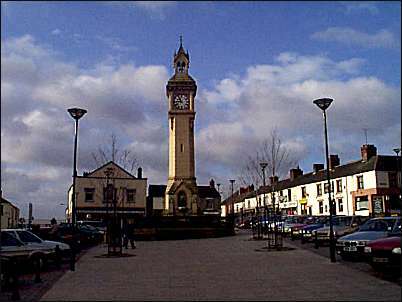 The tower stands on the site of the original town hall. It was built by public subscription to honour Sir Smith Child. behind the tower, on the left is the old Methodist Chapel. Piccadilly Street runs to the left and Paradise Street to the right. 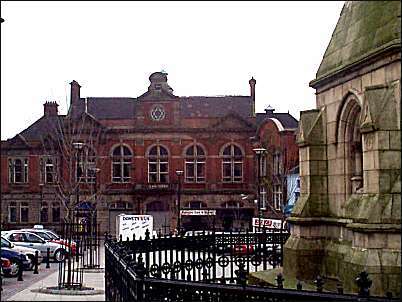 At the east end of Tower Square is the town hall, replacing the original town hall which was in the centre of Tower Square (then Market Square) - the original town hall was demolished in 1892. The replacement town hall, designed by A. R. Wood, has a Renaissance-style facade of nine bays. The first floor, of brick with stone dressing, features an intricate dentil frieze, with richly patterned, moulded tiles below. The first floor is finished with ashlar stone. The centre attic displays a Star of David. Behind the town hall is a covered market. Unlike the other Potteries town halls there are shop frontages incorporated in the ground floor. Did you live in this street or area?